Conor McGregor and the UFC may be at odds over his desire to have equity in the company, but Dana White insists that the star remains front-and-center in their plans. Not long ago, McGregor announced he was retiring from fighting. 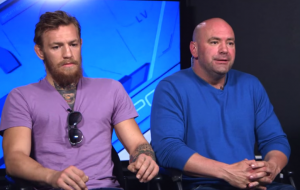 At the time, many speculate that the comments were due to the fact White had said McGregor would not receive shares in the UFC. “Conor McGregor will fight again,” White said. “Me and Conor communicate every day. We’ve been talking all this week. Things are good with Conor and I and we’ll get something figured out soon. “…He lost to the greatest boxer (Floyd Mayweather Jr.), arguably of all time, in a boxing match. Conor, was [in] his first boxing match and he did really really well. [He] earned a lot of respect from people from that fight. McGregor hasn’t fought since October, when he was submitted by Nurmagomedov at UFC 229.